In November of 2001 South African born Oscar winning actress Charlize Theron (North Country Monster) shelled out $2,200,000 to purchase a 3 bedroom and 3.5 bathroom ocean front getaway on La Costa beach in Malibu, CA. It wasn't long after that Miss Theron hooked up with Irish actor Stuart Townsend (Queen of the Damned, The League of Extraordinary Gentlemen) and in June of 2003, according to property records, his name was added to the deed for her Malibu getaway officially making it their Malibu getaway. 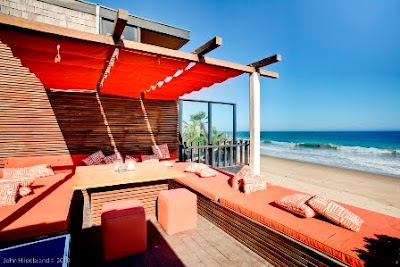 In early 2010, after a holiday vacation in Mexico, the couple's near decade long relationship swirled down the terlit of love and it wasn't long before the ex-lovebirds put their beach bungalow in the Bu up for lease at $30,000 per month. As it turns out the erstwhile couple isn't looking to just lease the house for a few months they're also interested in selling the 1930s beach house which hit the sales market today with an asking price of $7,500,000. Of course Your Mama don't know a stick of butter from a remote control doohicky, but we presume the sale of the abode in the Bu has something to do with the former couple divvying up their shared assets so that they can each move on with their individual lives without being all up with each others financial bizness. In September of 2007 Miss Theron and Mister Townsend each bought adjacent condos at the star studded Broadway Hollywood building in Hollywood. Combined they paid $3,985,500 for the two condos, the larger and more expensive 2 bedroom and 2 pooper duplex purchased by Miss Theron and the smaller open plan place bought by Mister Townsend. As of today neither condo appears on the open market and it's not known–at least not by Your Mama–if Miss Theron and Mister Stuart combined the two units into one large a-lister style duplex penthouse and/or if one or the other plans to lease or sell one or both of the condos. We lived on La Costa beach for a year. It was great. Only real negative is the location right on PCH. Parking is tough and during summer the traffic will back up in front of your house. The beach is almost private. There's no public access. This house looks UP the coast. The south view is blocked by Stephen Dorf's house next door. You'll see the occasional TV/film celeb walking the beach. Reese and Jake were an item when we lived there. The Osbornes still have a house there. Saw Farrah and Ryan a few months before she passed away.